This recipe contains a very high percentage of frit and thus has the potential to produce a super-transparent surface of high quality. It also has good application properties (if mixed properly, see below) and melts to a clear at cone 04-02. The high frit content also means it will fire to an equally good surface at all three cones. 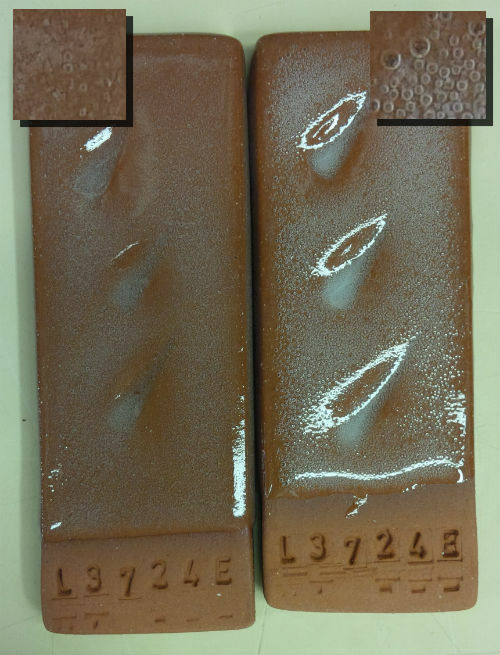 Although the glaze will melt also at cone 06 its bond with the body is poor at that low a temperature, it is much better to fire higher (cone 04 or 03). 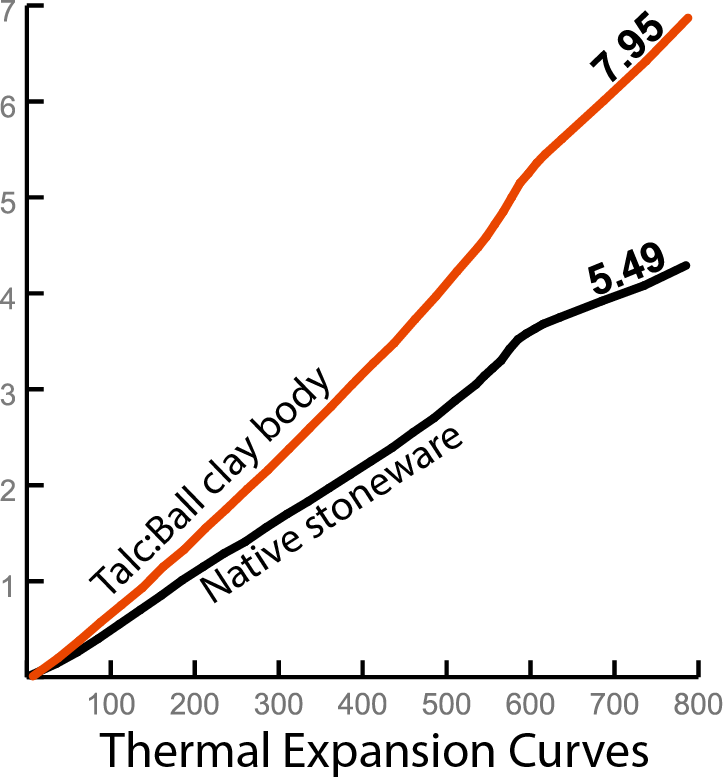 Additionally, this recipe is thermal-expansion-adjustable (using the method described below). High-expansion, super-glossy Ferro Frit 3110. By incorporating some of this (in place of the 3195) we get a glaze of higher thermal expansion (and better gloss). We tried Frit 3110:3195 ratios of 20:65 (this recipe) and 40:65 (G1916R). This eliminated the shivering we had. Of course, using too much Frit 3110 would induce crazing on a non-talc body, the opposite problem. Super-low-expansion, glossy Ferro Frit 3249. Although the amount is zero in this recipe, we have included it to show it as an option. If crazing is serious use this instead of Frit 3110. We found that 65:20 mix of 3195:3249 (G1916T) works on Plainsman Buffstone, for example. This frit-juggling strategy affords a wide range of adjustment for tuning the fit to a body. We suggest stress-testing the fit of the glaze recipe you decide on by subjecting a piece of thin-walled ware to boiling-water-into-ice-water (and vice versa) immersion. This will reveal misfit that will happen with time. Again, it is intended that you adjust the proportion of the frits (against each other) to react to any shivering or crazing that might occur with your clay body. For crazing, balance the Frit 3195 percentage with Frit 3249; in the event of crazing, do it with Frit 3110). We have had some issues with clouding when it is applied thicker. Of course, the goal with a transparent glaze is to produce a crystal clear (without micro-bubble clouds). 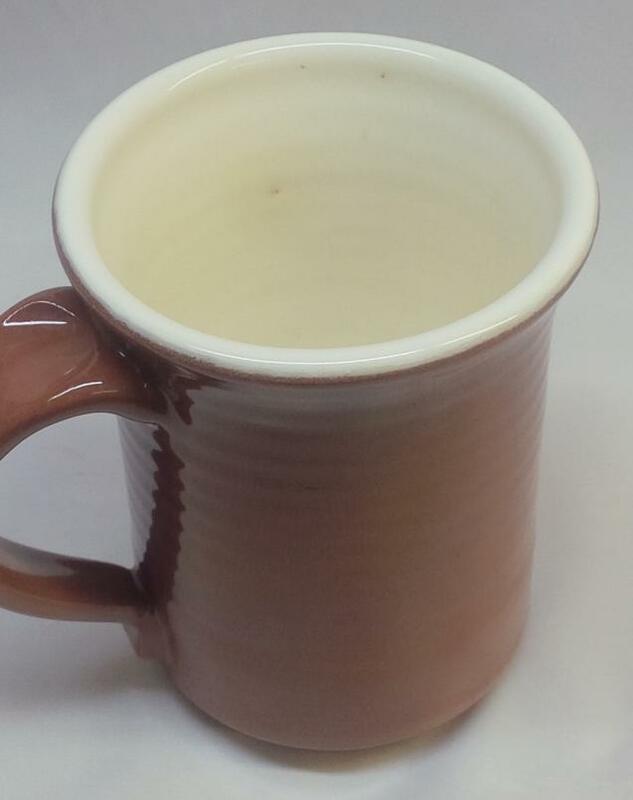 Low fire glazes are generally applied thinner than with stoneware, especially on white burning clays. To achieve this, try bisquing your ware higher (to get a less absorbent surface). 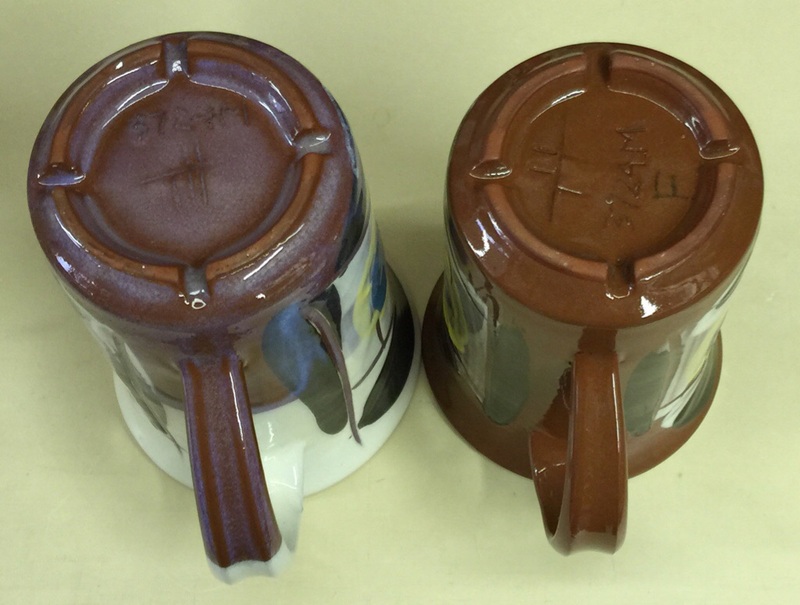 Or try tuning the glaze viscosity and specific gravity to be able to apply it thinner and evenly. A very good way to do this is to gel the slurry a little (by flocculating it; see the thixotropy link below for more info). If you do not mix this with the amount of water needed to make a creamy slurry it will apply too thick, too thin or unevenly. This recipe employs ball clay, feel free to substitute a kaolin (we have used EPK). The 15% clay is plenty to suspend the slurry (added bentonite is not needed). 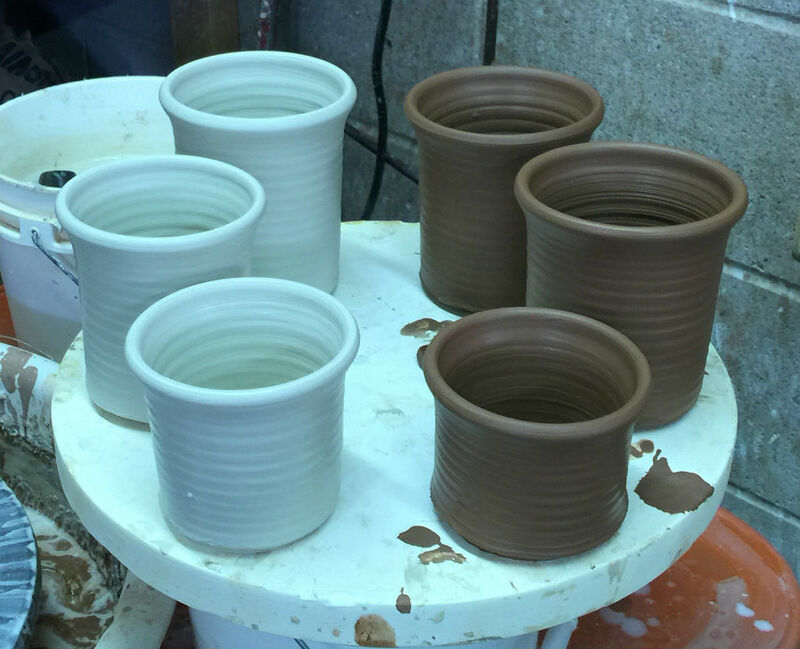 The best slurries for pottery are gelled slightly so they hang on in a even layer without dripping. Achieving this is a matter of specific gravity and the addition of a small amount of vinegar or epsom salts (see the thixotropy link below). What is that black stuff on these two glazes? 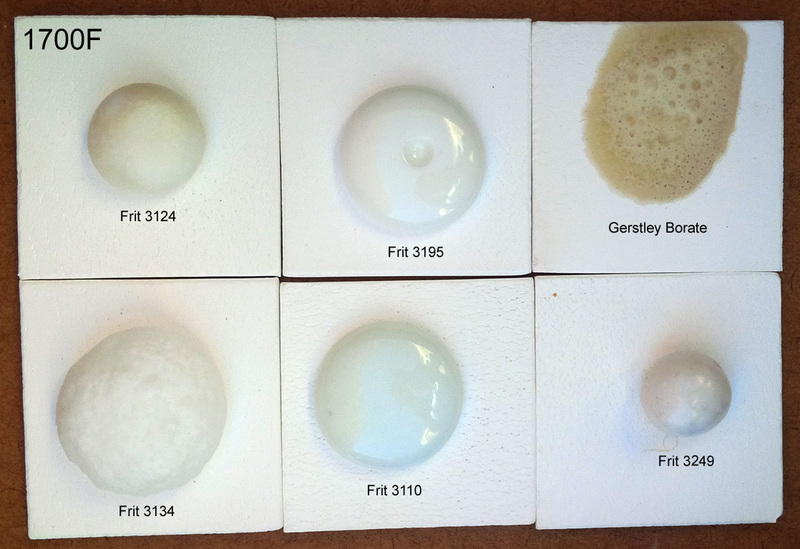 These are two 10-gram balls (formed by dewatering the glaze on plaster) of low temperature glazes (G1916J, G1916Q) containing only frit and kaolin fired to 1250F. The carbon is part of the LOI of the kaolin (that hardens and suspends the glaze). 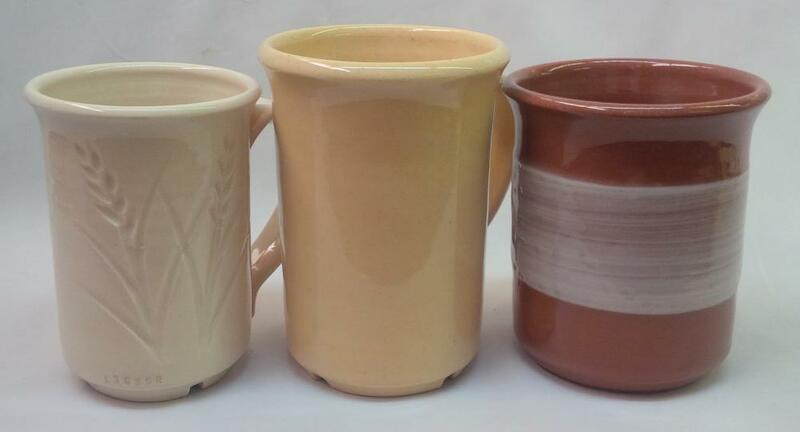 Yet these glazes have much lower carbon content than ones made from raw materials. How much does a glaze need to melt before it sticks to the body well? The back flat side of balls of 1916J and Q low fire glaze that melted into a dome shape after being fired to 1550F. 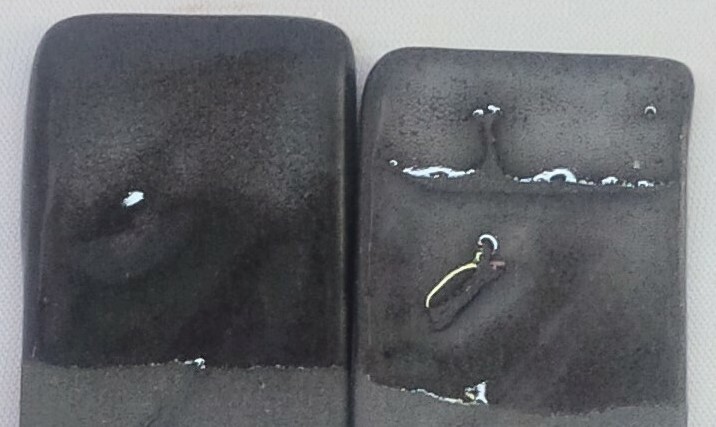 They have been turned over to see the back side (the front side is still stained by volatilizing carbon). Clearly they have reached zero porosity and are beginning to melt, yet they have not adhered to the vitreous porcelain tile! This demonstrates the degree to which an engobe must melt to secure itself well to the underlying body. This is a cone 04 clay (Plainsman Buffstone) with a transparent glaze (G1916Q which is 65% Frit 3195, 20% Frit 3110, 15% EPK). 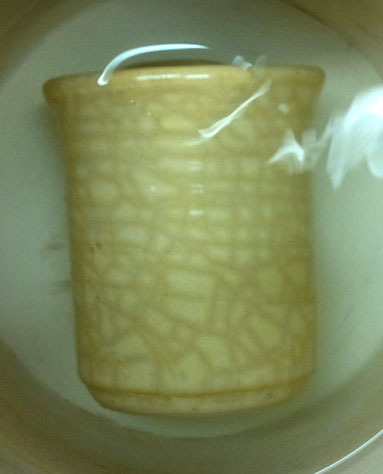 On coming out of the kiln, the glaze looked fine, crystal clear, no crazing. However when heated to 300F and then immersed into ice water this happens (IWCT test)! At lower temperatures, where bodies are porous, water immediately penetrates the cracks and begins to waterlog the body below. Fixing the problem was easy: Substitute the low expansion Frit 3249 for the Frit 3110. 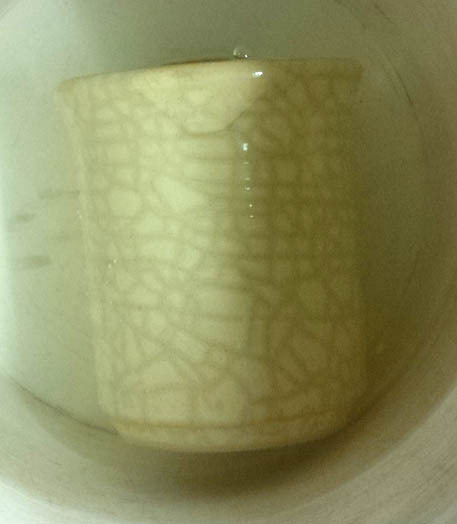 This cone 04 mug has survived the thermal shock of a 300F to Ice-water IWCT test, one which a similar recipe failed badly. This is G1916T glaze on Plainsman Buffstone fired to cone 04 (the failing recipe was G1916Q). The difference? This one switches the Frit 3110 for Frit 3249. G1916J (85% Ferro Frit 3195, 15% EPK) fired to cone 04 on Plainsman Buffstone and then 300F-Ice-water shocked (IWCT test). It tests better than 1916Q (which has some Frit 3110) but not as good at 1916T (which contains Frit 3249).